It was in the Porto and in the North regions that Portugal was founded in the 12th century and the Portuguese became a people and a nation. Porto, a World Heritage city, is the gateway and departure point for a journey across the natural and cultural diversity of the region. It is known for the Port wine which is shipped from here all over the world, but also for a heritage which combines ancient churches and monuments, such as the Cathedral and the Church of São Francisco, and modern buildings, such as Casa da Música and the Serralves Museum. And also for its School of Architecture which bred names like Álvaro Siza Vieira and Eduardo Souto de Moura, both winners of the Pritzker Prize. The region is crossed by the River Douro which enters Portugal between the ravines and mountains of the interior to flow through the entire World Heritage landscape where the Port and Douro wines are produced. It is from here that the wine is sent to the lodges at Vila Nova de Gaia, as the cruises touring the region make their way upriver. 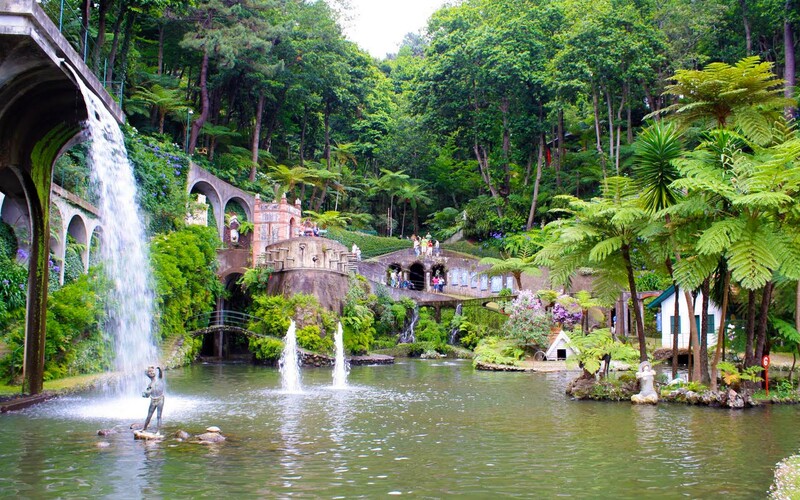 In this area of mountains and natural parks, the region's heritage is seen in its castles, such as the one in Guimarães, and the shrines and churches which are the stage for pilgrimages in the summer. You will find the Baroque architecture of Northern Portugal in its stone and gilded carvings side by side with rural chapels. In its cities, which retain a human scale, such as Viana do Castelo, Braga, Lamego, Chaves and Vila Real, and in the manor houses and stately halls, you will find the genuine Portuguese people, who like to share their table, their customs and traditions. In Porto and Northern Portugal, the joy and gratitude for all we have and are is experienced in the most spontaneous way. But there are other unique features that are well worth discovering. For example, the historic villages and castles that defended the nation's borders. The Schist Villages and the towns of whitewashed houses, like Óbidos, a treasure within walls. The cities, where modernity is combined with tradition - Coimbra, the university city, Aveiro between the Ria and the sea, and Viseu, Guarda and Castelo Branco, in which the stone architecture retains traces of an immemorial past. Serra da Estrela, the highest peak in mainland Portugal, is the star of the mountains, with its endless landscapes and glacial lagoons. But there are also the Lousã, Açor and Caramulo ranges, where you can discover nature by hiking or by bike. Here you can also try rock climbing, abseiling, rafting or canoeing, for example in the Naturtejo Geopark, a preserved area where several species of birds and animals live. The crystal clear waters that rise from the thermal springs balance the body and soul. And the beaches! River beaches surrounded by forests and coastal beaches open to the Atlantic ocean, provide certain freshness on hot summer days. They are also well known spots for surfers from around the world, who come for the perfect waves in Peniche, and even the giant waves in Nazaré. In a city that has been influenced by many different far-off cultures over time, there is still a village feel in each historic neighbourhood. Stroll through the Pombaline grid of streets in the Baixa district that opens on to the Tagus in Praça do Comércio, then follow the river to discover some of the city's most beautiful parts: the monumental area of Belém with its World Heritage monuments, the mediaeval quarters and the latest contemporary leisure spaces, such as the Parque das Nações. If you continue to the mouth of the river, you'll understand why we say that Lisbon is the centre of a vast resort. Along the coastal road you'll find beaches and beach resorts that combine villas and hotels from the beginning of the 20th century with marinas, terraces and excellent golf courses. 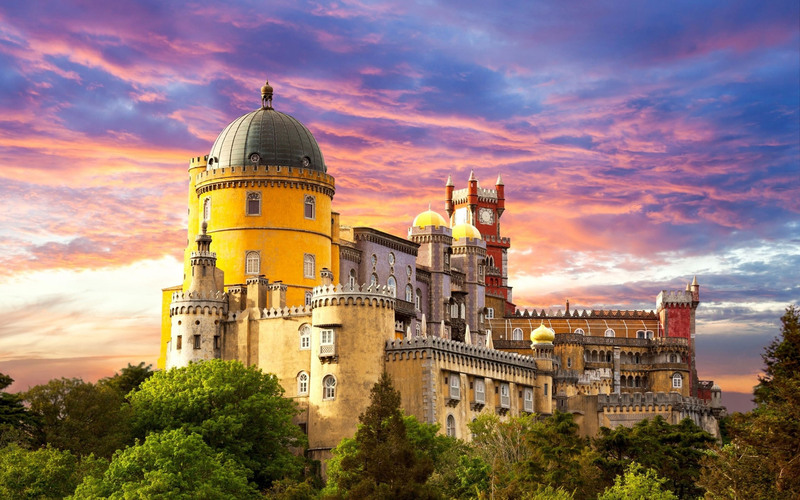 Further along the coast you'll come across world-renowned surfing beaches, but also the palaces scattered across the cultural landscape of Sintra, a World Heritage Site. The wide variety of landscapes and heritage is always close by, whether to the north or south of the capital. With beaches, natural parks, cultural routes and accommodation for all tastes, it is hard to escape the Lisbon region on a visit to Portugal. Fado is another expression of what it is to be Portuguese that has also been awarded World Heritage status. You can hear it at night in a fado house or in a traditional neighbourhood. But go, as well, to the lively bars and nightclubs, to find other types of music. From reggae to African music, new wave, indie or electronic, there's a great diversity of sounds and environments, but all are good excuses to have a drink and dance the night away. The plains that extend as far as the eye can see start close to the Tagus. While to the north, the pace is set by the green of the flatlands, further south the landscape combines with the sun, the heat and a slower pace of life. This is the Alentejo. To the north, the pastures of the marshlands; in the vast interior, unending flatness, and fields of wheat waving in the wind; at the coast, wild, beautiful beaches waiting to be discovered. The vastness of the landscape is dotted with cork oaks and olive trees that withstand time. Santarém is a natural viewpoint over the immensity of the Tagus. Here and there, you find a walled town, such as Marvão or Monsaraz, or an ancient dolmen to recall the magic of the place. Around the hills, low, whitewashed houses stand on small knolls, castles evoke battles and conquests and the yards and gardens are witness to the Arab influences which shaped the people and nature. In the Alentejo the power of the land marks the time and cities like Elvas and Évora, listed as World Heritage by UNESCO, show the tenacity of the people. Perhaps this is the reason that culture and spirituality take on a singular character here. These memories of the past are also shared by other cities, such as Santarém, Portalegre and Beja, and in the former Jewish quarters, particularly in Castelo de Vide. The flat land makes hiking and cycling easy, though horses are also part of the landscape. You can combine these rides with birdwatching and, in dams such as Alqueva, with the tranquillity of the waters or stargazing. But you must also explore the coast. The landscape here is hilly and rugged, with small sheltered coves between the cliffs, many of which are ideal for surfing. You will also breathe the scents of the countryside here, the aromatic herbs that season the fish, seafood and other regional fare to be accompanied by the region's excellent wines. Indeed, the entire Alentejo lives according to the rhythm of the earth. It was here that, in the 15th century, the Portuguese set off on the epic journey that led them to discover other peoples and cultures; and it is in the Algarve that we cheerfully welcome many of our visitors. Even the climate is mild and sunny all year round! There's no shortage of high quality beaches either. Sandy stretches as far as the eye can see, framed by golden cliffs, virtually deserted islands marking the boundary between Ria Formosa and the sea, and small coves sheltered by the rocks. The ocean, in every shade of blue and mostly calm and warm, invites you for long swims and to indulge in water sports. And there are also the mountains, where people live in harmony with nature and maintain traditions that they love to share. And the cities. Silves preserves traces of its Arab past and Lagos from the time of the Discoveries. More cosmopolitan Portimão and Albufeira are bustling towns by night and day. Tavira is a showcase for traditional architecture and Faro, the gateway to the region, deserves a long stop to discover its beautiful historic centre. To relax, you can have various treatments in the spas and thalassotherapy centres and in the Monchique Thermal Baths. There are also many internationally acclaimed golf courses where you can enjoy a spot of exercise. And hotels, tourist villages, resorts, from the simplest to the most sophisticated. In short, a varied array sharing a genuine love for hospitality. You can use footpaths and cycle trails to get to know the region, such as the Algarve Way inland or the Vicentine Route along one of the best preserved coastal stretches. And boat rides are another ecological way to observe the flora and fauna. At the table, you will be delighted with the fresh fish and seafood, either grilled or in a casserole. These are divine flavours which you can enjoy on a simple beach terrace or in the most refined Michelin-starred restaurants, where chefs turn out new versions of traditional cuisine. There are further experiences not to be missed on a visit to the region. Mother Nature has created a land full of natural beauty, ready to be explored, in the blue immensity of the Atlantic Ocean: the Azores. To the East, on the island of Santa Maria, the beaches of warm white sand are inviting, and the vineyards covering the slopes like an amphitheatre resemble giant staircases. 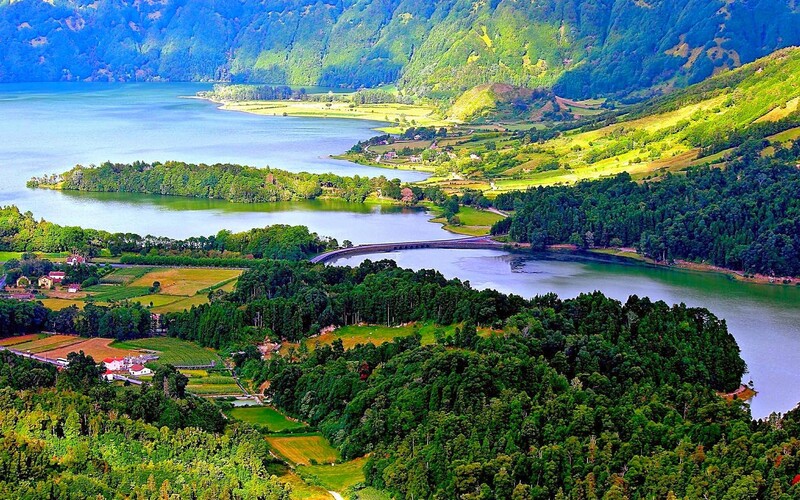 São Miguel, the largest island, is seductive with its Sete Cidades and Fogo Lagoons. The power that emanates from the earth is felt in the geysers, hot thermal waters and volcanic lakes, as well as in the tasty "Cozido das Furnas" slowly cooked inside the earth. In the Central Group, the islands of Terceira, São Jorge, Pico, Faial and Graciosa are set harmoniously in the deep blue sea, where whales and dolphins can be spotted, to the delight of visitors. On Terceira, the World Heritage town of Angra do Heroísmo, as well as its festivals, is steeped in history. Faial is the cool blue of the hydrangeas, the marina painted colourfully by yachtsmen from all over the world and the extinct Capelinhos volcano, which resembles a lunar landscape. In front is Pico, a mountain that emerges from the sea, with vineyards planted in black lava fields, a unique culture that also has World Heritage status. On São Jorge, the highlights are the Fajãs and the cheese, a unique specialty with an unmistakable flavour. Graciosa, graceful in both name and appearance, is an island of green fields covered with vineyards that contrast with its peculiar windmills. In the Western group, on the island of Flores, the beauty of the natural waterfalls and lakes carved out by volcanoes is dazzling. The tiny island of Corvo has a broad, beautiful crater at its centre, and attracts many species of birds coming from both Europe and America. These are the Azores. Nine islands, nine small worlds that have as many similarities as differences, but where the friendliness of their inhabitants is shared by all. Right in the middle of the Atlantic, the islands of Madeira and Porto Santo are a haven of natural beauty. The exotic colours of the flowers stand out from among the blue sea and the emerald green vegetation; this is an archipelago where two thirds are a protected area and where the largest Laurisilva forest in the world is located. Popular feasts, which take place all year round, are opportunities to appreciate traditional gastronomic flavours and see Madeira partying, especially for the Carnival parades, the Flower Festival, the Atlantic Festival and, above all, the end-of-year fireworks display. 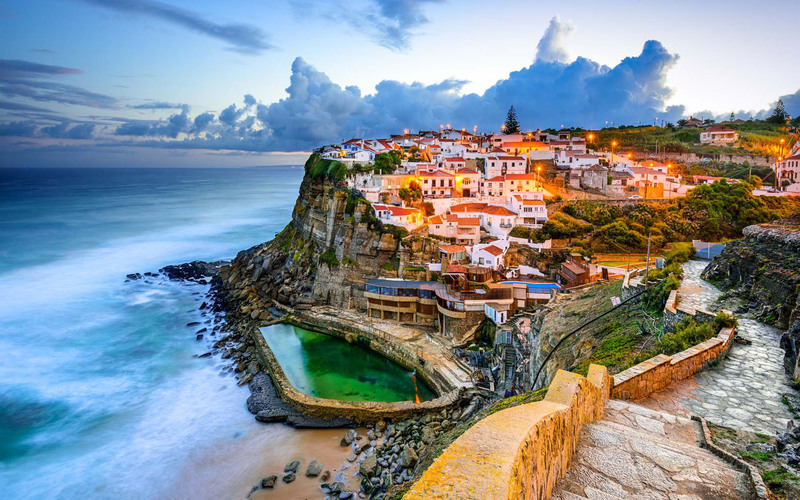 Portugal has a temperate Mediterranean climate and is one of the warmest European countries: the annual average temperature in mainland Portugal varies from 8-12°C (46.4-53.6°F) in the mountainous interior north to 16-18°C (60.8-64.4°F) in the south and on the Guadiana river basin. The Algarve, separated from the Alentejo region by mountains reaching up to 900 metres (3,000 ft) in Alto de Fóia, has a climate similar to that of the southern coastal areas of Spain or Southwest Australia. Annual average rainfall in the mainland varies from just over 3,200 mm (126.0 in) in the northern mountains to less than 300 mm (11.8 in) in the area of the Massueime River, near Côa, along the Douro river. Mount Pico is recognized as receiving the largest annual rainfall (over 6,250 mm (246.1 in) per year) in Portugal. In some areas, such as the Guadiana basin, annual average temperatures can be as high as 28°C (82°F), and summer highest temperatures routinely are over 40°C (104°F). The record high of 47.4°C (117.3°F) was recorded in Amareleja, although this might not be the hottest spot in summer, according to satellite readings. Snowfalls occur regularly in the winter in the interior North and Centre of the country in districts such as Guarda, Bragança, Viseu and Vila Real, particularly on the mountains. In winter temperatures may drop below -10.0°C (14.0°F) in particular in Serra da Estrela, Serra do Gerês, Serra do Marão and Serra de Montesinho. In these places snow can fall any time from October to May. In the South of the country snowfalls are rare but still occur in the highest elevations. Portugal has around 2500 to 3200 hours of sunshine a year, an average of 4-6 h in winter and 10-12 h in the summer, with higher values in the south-east and lower in the north-west. The sea surface temperature on the west coast of mainland Portugal varies from 13-15°C (55.4-59.0°F) in winter to 18-22°C (64.4-71.6°F) in the summer while on the south coast it ranges from 15°C (59.0°F) in winter and rises in the summer to about 23°C (73.4°F) occasionally reaching 26°C (78.8°F). Both the archipelagos of the Azores and Madeira have a subtropical climate, although variations between islands exist, making weather predictions very difficult (owing to rough topography). The Madeira and Azorean archipelagos have a narrower temperature range, with annual average temperatures exceeding 20°C (68°F) along the coast (according to the Portuguese Meteorological Institute). Some islands in Azores do have drier months in the summer. Consequently, the island of the Azores have been identified as having a Mediterranean climate, while some islands (such as Flores or Corvo) are classified as Maritime Temperate and Humid subtropical, respectively. Porto Santo island in Madeira has a semi-arid steppe climate. The Savage Islands, which are part of the regional territory of Madeira and a nature reserve are unique in being classified as a desert climate with an annual average rainfall of approximately 150 mm (5.9 in). The sea surface temperature in the archipelagos varies from 17-18°C (62.6-64.4°F) in winter to 24-25°C (75.2-77.0°F) in the summer occasionally reaching 25°C (77.0°F).